When the British Hamper Company got in touch with me and explained that they worked with small, artisan and independent food producers, my e-ears pricked up. It wasn’t too much longer before a Divinely Decadent Chocolate Hamper arrived at my door. Woohoo! Who can resist a well put together hamper? Not me, it seems. There’s something so luxurious about receiving a hamper, that the feel good factor it gives is hard to put a price on. 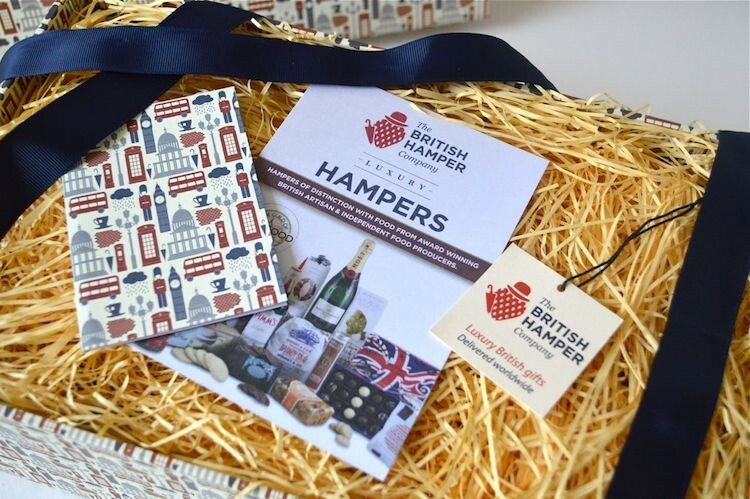 As the name suggests, The British Hamper Company is a family run firm that delivers luxury British food hampers both to the UK and around the world. As already mentioned, the products are all from independent producers, which gets it several brownie points from me. I’ve had a good look around the site and I haven’t spotted many hampers I would say no to. The Divinely Decadent Chocolate Hamper met with my approval as soon as I took the fabulous box out of its packaging. Beautifully presented, with an accompanying gift card and ribbon tying it together, I spent quite some time admiring it before I could bring myself to open it. The box is sturdy with an attractive and clever design which needs a little studying to fully appreciate it. The colours are reminiscent of the blue and red you’d expect from something loudly proclaiming its British credentials, but they are subtler, a reddish brown and a blueish grey. The pictures are of typical London icons, but with a wry touch of humour; the inclusion of a raincloud certainly made me smile. The box makes a nice change from a wicker hamper and it’s a keeper. I’m now contemplating what I can store in it, once the chocolate contents have disappeared – which probably wont be very long. So, you may well be asking, what was inside the the Divinely Decadent Chocolate Hamper? On opening the lid and hunting through the wood wool, I found seven well chosen items. Not only were they all of good quality, but there was a nice mix of products, from truffles, to tiffin to drinking chocolate, from dark chocolate to milk – something for everyone. I was familiar with some of the brands, but not all of them. If this box of delights doesn’t grab your fancy, there are plenty of other chocolate hampers to choose from. As I have probably said more times than I care to think of on this blog, a really good quality high cocoa content milk chocolate is my absolute favourite. Willie’s Milk of the Gods ticks all the right boxes. Willie Harcourt-Couze is a bean to bar chocolate manufacturer in Devon who sources his chocolate ethically from single estates around the tropics. Originating from the Hacienda San Augustine estate in Venezuela, this bar is made from Trinitario cacao beans and has a cacao content of 44%. The ingredients are simple: no lecithin, just cacao beans, raw cane sugar and milk. It tastes sublime, which strangely is what it says on the packet. It’s rich with a smooth texture and has the slight tang of buttermilk which I really like and immediately associate with good quality milk chocolate and its not too sweet either. It comes in a single 50g block, so it’s obviously not made to be broken up into neat little pieces and shared – or that’s how I read it. Tiffin is always a hit in this house and the six pieces of belgian chocolate mixed with cherries, sultanas and crisp biscuit pieces didn’t last long at all. The dark chocolate made them rich and not too sweet, which is just how I like them. My mother is a big fan of Monty Bojangles, so the 100g box of cocoa dusted truffles is destined for her. In fact Monty Bojangles’ truffles proved such a hit when I introduced them to her a couple of years ago, that they have become a firm favourite with various, aunts, uncles and cousins. I’ve not tried these particular ones before, but I’m sure they won’t disappoint. I have a real weakness for peppermint chocolate and blame it all on my first childhood sweet making activities when peppermint creams were about all I could cope with. The fondant creams in this 90g box are covered with 55% dark chocolate and dark chocolate is just what is needed to offset the sweetness of the filling. I’d not heard of Mr Stanley before, but it seems he started up business in 1843 and the traditional confectionery made today is still produced in copper pots. I’d never heard of Chocca Mocca before. Apparently they are a group of fine chocolate aficionados who cover sumptuous fruit and nuts in chocolate. The rather attractive box I received contained 100g of little sticks of crystallised orange peel covered in a 65% dark chocolate. They were tasty and the orange came through loud and clear, however both CT and I thought they would have benefited from being a little less sweet. I do like the, err, odd cup of hot chocolate, so the 150g tin of Belgian milk chocolate drops is very welcome. The tin is tall and elegant and will be retained to fill with more drinking chocolate once this has run out. I haven’t wanted to break into it yet, but I’ve subsequently heard, that the tiny chocolate buttons are wonderful eaten just as they are. It will be interesting to try though, as I tend to use dark chocolate only when making hot chocolate at home. The South Devon Chilli Farm is another company that is local (ish) to me, so it would be a sad thing indeed if I hadn’t sampled their wares before. All the chillies contained in their chocolate are grown on the premises. I’m a big fan of chilli chocolate and this 60% dark 100g chocolate bar is best nibbled at in small doses. It’s certainly a good way of firing up your body for an up-and-at-’em event. The British Hamper Company is kindly offering one Tin and Thyme reader a a Divinely Decadent Chocolate Hamper worth £50. To be in with a chance of winning, please fill in the Gleam widget below. You will need to leave a comment on this post, answering the question, which then gives you additional chances to enter if you so wish. Gleam will pick a winner at random from the entries received who will then be contacted via e-mail. If you are commenting anonymously, please give me some way of identifying you as I will be verifying the validity of entries. Any automated entries will be disqualified. This giveaway is only open to those with a UK mainland postal address. Winners will need to respond within 5 days of being contacted. Failure to do this may result in another winner being picked. There are no cash alternatives. The Divinely Decadent Chocolate Hamper is offered and provided by the British Hamper Company and Tin and Thyme accepts no responsibility for the acts or defaults of said third party. Tin and Thyme reserves the right to cancel or amend the giveaway and these terms and conditions without notice. Lindor or Galaxy as they are both my favourite brands – their chocolate seems to melt in my mouth! Delicious! Guylian Chocolate Seashells or any other chocolates from their delicious range. Lindt because I love it above all others, it is just so smooth and delicious. Martin’s Chocolatier Raspberry, Marc de Champagne, White Chocolate truffles because they taste absolutely wonderful. That they do. We have a fab one down in Cornwall, but he’s chocolate are still not that easy to come by. I’ve not heard of them Lucy. I do like to hear about local chocolate companies. I’ve never had Monty Bojangles and would love to try it. I would like to see more unusual chocolates. Something artisan or decadent! I do love chocolate! Haha, you and me both Alica. Green and Black’s was the first “ethical’ chocolate I ever tasted – way back when. So I have a bit of a soft spot for it. Hotel Chocolat because it’s the best I’ve tasted. I would like to see Booja-Booja Rum Sozzled Sultana Chocolate Truffles; choc and alcohol is a fab combo. Ooh nice choice Susan. Booja-Booja are fab, though I haven’t tried those particular ones. I’d love to see Ferrero Rocher in there as they are delicious, there are lots of variety in the range and they have that little touch of luxury! To be honest the chocolate I’ve mainly eaten has been produced by the big names, so I can’t really say which brand would be good in the hamper other than saying a range of chocolate from small artisan producers as it would seem more luxurious and special. Yes, it’s not all that easy to get hold of artisan / independently produced chocolate Angela, but I know Waitrose stock a few good ones. I absolutely love anything by Galaxy – even though it’s calorific ! I’d love to see Ghirardelli chocolate from San Francisco! It’s so smooth and creamy, and VERY moor-ish! Another one I’ve not heard of William. I think I’m going to have to make a list and have a plan to try them all – somehow! I would like to see Endangered Species Chocolate because it is non gmo. I’ve not come across that one Anne. Sounds interesting, although any organic chocolate should be non GMO. any chocolate in any brand is ok in my book! I have never had Hotel Chocolat so that would be nice to try. I’d like to try one of the Lakrids combinations of chocolate and liquorice, such as the Raspberry Chocolate Coated Chilli Liquorice. Ooh, that does sound interesting Suelle. I think I’d like to try that too. Hotel Chocolat or Lindt because I love their chocolate ,its so rich and luxurious. Lindt, their chocolate is AMAZING!! What is it about hampers that always seems to devilishly appealing? I love chocolate – milk, white, dark but always veer towards Swiss, rather than Belgian. Booja Booja is fantastic and Hotel Chocolat I know well, but I’ve not heard of Gnaw before. That’s a lovely chocolate hamper! It really is Angie. The chocolates are all lovely, but I think my favourite part is the box. I’ve not heard of Sees, I will have to check them out. My favourite chocolate brand is Booja Booja because their truffles are divine and they are dairy free. I haven’t had Booja Booja in a long time, but they are gorgeous Susan. Oh good idea Heather. I’ve tried a couple of their chocolate products and they are very good. Cadburys as I’m a huge fan. They have such a great variety, but i am more than happy with Dairy Milk. I know it’s in the picture but I’d love to try Monty Bojangles just because I’ve never tried them and they look great. Orange peel covered in dark chocolate as it could be one of my five a day! My mother and nannies favourite topic of conversation is how downhill Cadbury has gone! Hotel chocolat is a real treat. And I like galaxy too. This hamper looks amazing! Fingers crossed. Definitely Cocoa Loco as their products are all organic and FT plus artisan and small batch produced. Booja Booja has long been a favourite – simply delicious ! I agree, Booja Booja are some of the best. This is a comment not an ‘entry’! I’m posting on Charlotte Flowers Chocolates because I have honestly never tasted anything that blew my palette (and my mind) like these chocs do. I love her mint chocolate which tastes just like freshly picked mint – and I don’t even like mint chocolate! Artisnal, sustainable cocoa, locally sourced flavours from the Scottish hills and…well, try them! I am not connected to the business btw, i just loved them. Oh, thank you Anita. I’ve not heard of these, but they sound wonderful. Dairy Milk as Delicious. Also Divine, as Divine. Also Lindor as Tasty. I do so like chocolate. Belgian chocolate/s Wonderful. Hotel chocolat is my favourite especially the slabs they do. I would like to see Hotel Chocolat, as I love their chocolate slabs and always plump for the Rocky road one, with the combination of different pieces to bite into, it’s really nice. I would love to see some green and blacks in the hamper – Especially the Butterscotch! Probably hotel chocolat, but I do love kinder chocolate but not sure it would fit in with this hamper, either would be fine by me! My preference would be for a variety, I like to try different kinds. I love Greens & Black because their organic and made ethically. Hotel Chocolat is my favourite . As a company they care about sustainability and climate change, and their Rocky Road Slabs are to die for! Lindt because I love Swiss milk chocolate in particular, although I love all chocolate! I would love to see Lindt as their chocolate is so yummy! Hotel chocolat as they are my absolute favourite, and I find that they actually last for ages because they are so rich, I only need one at a time! Hotel Chocolat is always delicious. Any brand of good quality chocolate gets my vote every time. I love Lindt chocolate, but I also love trying anything new and different. I especially love dark chocolate. Seed and Bean. Because it’s Organic, fairtrade and ethical, definitely feel less guilty eating a whole bar for this reason! I love most chocolate but it would be lovely to maybe include some chocolate from some smaller producers which might make some surprise flavours/combinations. Green and blacks, because I really love the Milk chocolate and butterscotch bars. Lindt because I love it. It would have to be Lindor for me – I’m slightly obsessed with all of the flavours! everybody in my home loves Lindor chocolates. I quite like Green and Blacks chocolate, so I’d like to see some more of that. Lindt – you cannot beat that chocolate! Rococo – bought my step-dad a lovely easter egg from them this year and I was very impressed with the detailing and taste! They are a fab brand Hannah, though I’ve only tried a couple of their chocolates. Good choice. love green and blacks- particularly the butterscotch- delicious! thank you for the great prize! Ooh, another one I’ve not heard of Heather. They sound interesting. The ferrero chocolates that are difficult to find in the UK like the coffee pockets. My favourite chocolate of all time is Cadburys. You can’t beat a bar of good old Cadburys Dairy Milk. Booja Booja are my mum’s favourites at the moment as they are delicious and vegan too <3 I would go for lindor hands down, it's so smooth and melty…..and mmmmmmmmmmm….. I love Cadbury’s or Lindor. Both absolutely delicious. Monty Bojangles – really lovely chocolates in nice packaging at an affordable price. I love lindt chocolate, it is so creamy and tastes great so would love to see it in the hamper. I love Montezumas, it’s tasty. Locally I have also bought Seven Hills chocolate, they have some lovely flavours. I’m a bit boring because my favourite all time chocolate is Dairy Milk. Would love to see some bars of that included. Maybe a few Fererro Rocher too. I’d like to see Gnaw chocolate. It’s a local (Norfolk) brand that looks amazing, but is just a little bit too expensive for me to treat myself. Not one I’ve tried Johanne, in fact I’ve not heard of any chocolatiers in Norfolk, so good to hear. Some Greens chocolate, so many different varieties – yum! Cote d’Or as I adore their chocolate Bouchee praline elephants. Galaxy as it just has that perfect ability to melt in your mouth perfectly. I would love to see Lindt in it because it’s my favourite chocolate. Tastes so yummy. Cocoa Mountain. They are based in the far north of Scotland. The landscape is stark, the wind usually howling and there’s nothing for miles around. In the middle of it all is a chocolatiers and they are so good at it with amazing, inventive flavours and lovely presentation. Oh, what a picture you conjure up Caroline. I’ve heard of them, but never tried their chocolates. I would love to see Green and Blacks chocolate because it is so tasty and comes in an amazing variety of flavours. I have a thing for chocolate with salt in it… and even more so if it’s got caramel and salt in it. And the best I have ever had is from “Paul A Young” find chocolates – it’s amazing. I think I might just have to agree with you there, although our Cornish salted caramels from Chocolarder are hard to beat. Hotel chocolat ia my absolute fave! I would love to see Thorntons, as it is so yummy and my favourite chocolate. Thanks for the yummy giveaway. Divine chocolate range. I love their darker chocolate range they have a great selection. I suspect you are right Francesca. I have the Chococo book, but have never tried their chocolate. I would like to see some independant chocolate companies. Green and Blacks white chocolate, something from the raw chocolate pie company or… (Dare I say it…?) a Wispa. What a philistine I am. My favourite is Lind chocolate! But highly recommend trying some polish milk chocolate GOPLANA! I very much doubt I’ve ever tried Polish chocolate karolin a – something that needs to be remedied. Lindt because it melts in your mouth. I would like booja booja chocolates to be included because they are so luxurious! Pemberton’s Chocolate Farm in Carmarthenshire produce some lovely chocolate. Would be great to have some from the Principality. I am a big fan of Montezumas Chocolate! So Delicious! Yes, I agree Jennifer and thankfully there are many really good quality chocolates out there, although never enough of them are organic. I am really into galaxy at the moment, or cadburys caramel. Lindt chocolate is my fav even though its not British enough for the hamper!! I’d add Divine Chocolate (http://www.divinechocolate.com/uk/) to the bundle… because, well, it’s in the name, isn’t it? Hahaha, good one Simon. It’s a good ethical company too. I would love a milk or dark chocolate with an orange or raspberry crème in the middle! That would be lovely! I love a fruity cream in the middle of chocolate, yummy combination. I love Lindor chocolate and Bendicks,Also only like plain chocolate. my fave chocolate is Cadburys so would be great to see in the hamper. Very lovely prize, and as usual, my mind goes blank at this sort of question. I do like the Booja Booja suggestion, then there would be something for my vegan daughter. Lindt as I’ve recently discovered them when I was given a box as a thank you. Cadbury’s used to be my favourite but they’ve not tasted the same for a while. Lindt truffles – they just melt in your mouth!! I’d love to see some Lindt in there, it’s my favourite! I love lindt and would love to see that in the hamper. I would love to see some Thorntons Continental Chocolates. Delicious flavours. Ooh, I didn’t know they’d started making chocolate Glenda. I’d better check that out. Thanks for the heads up. Id love to see ferrero rocher love them. Lindt, especially the white one as it’s the creamiest and scrummiest of them all. I’d like to see Booja Booja chocolates in the hamper. Organic, ethical and delicious, what could be better? Good choice Jane. I haven’t had any Booja Booja in far to long. Oh, I didn’t know it began in Huntingdon. I had family that I used to visit there as a child. I have just discovered Creightons – they have some unusual flavours like Custard Cream chocolate bar – delicious and gorgeous packaging too! Ooh, custard cream chocolate sounds like something that has to be tried Claire. Green and Blacks – I love their dark chocolate! I am a big fan of Montezuma’s chocolate, such great tasting products, they are innovative and also make it all themselves! Galaxy chocolate – it’s so creamy and Moorish, just one bite isn’t enough. Hotel chocolat is good as is Terry’s chocolate orange! They would both be great! what a lovely looking hamper, beautifully displayed too! Lindt chocolate as it is my absolute favourite. It’s just so creamy & rich tasting. I would love to see Seed and Bean as they are handmade in England (and I like to champion British products). It is also an ethical Fairtrade and artisan brand of chocolate. Last but not least they taste fantastic and come in so many gorgeous flavours. My favourites being; lemon and poppy seeds, raspberry and vanilla, Cornish sea salt, hazelnut and almond…..plus lots of others! divine as they have strong morals and its so yummy!! Good choices all, although I’ve never tried Pump Street nor Amelia Rope. I would love to see Deliciously Honest handmade raw chocolates. Their chocolate is gluten free, dairy free and made without processed sugar. It tastes fabulous . I really like their raw lavender chocolate and also raw rose chocolate. They are based in Hampshire. Ooh another chocolate company I’ve not heard of. Love the sound of raw rose chocolates. Divine chocolate is delicious especially the raspberry one! I agree and it makes very nice chocolate cakes too Lianne. How lush is this prize. I’d have a girly night in with my daughter and see how much we could munch through! I love Holdsworth Artisan chocolates and the The Raw Chocolate Company, either would be amazing. I’m hearing about so many new chocolate companies through this giveaway, Holdsworth is one such. So much to explore. Booja Booja dairy and gluten free chocolate – or Green and Black’s 85% Dark Chocolate because the antioxidants are actually good us! Oh good choices and isn’t wonderful to discover that chocolate can be good for us? I’d love to see Montezuma’s chocolates in the hamper, they’re so delicious! There’s a small shop called I Should Cocoa in Derbyshire which makes yum chocolate! I would like to see Lindt chocolate in the hamper as it’s so delicious! I do love Lindt chocolate but any chocolate at all is always welcome! Oh yes, good idea, their fudge is just gorgeous Susan. True Sarah, I can’t imagine many people turning it down. Hotel ch0colat – chocolate delivered from the gods above! I like Tunnock’s Caramel Wafers, I could eat an entire packet. Maybe some Lindt, I can’t get enough of their chocolate at the moment! Very unsophisticated of me but I really like Galaxy chocolate but also very dark chocolate. Paul A. Young (their caramelised milk chocolate is unbelievable, but last time I looked, their site didn’t have an online shop), Dark Sugars (very moreish truffles) or Café-Tasse or Élisabeth (these last two are Belgian chocolatiers I miss from when I lived in Brussels). I’ve not heard of the Belgian chocolatiers, but Paul A Young would be very near the top of the list for me too. Ghirardelli chocolate from San Francisco .. it is my favourite of all time ! Somehow the US doesn’t come to the fore when I think of good chocolate, so interesting to hear about Ghirardelli. this looks like my kind of prize. I would like to see Divine chocolate in this hamper because it really IS Divine, and ever so yummy! Green & Blacks because they do loads of different ones and they are tasty. Conscious – as it’s raw, organic, dairy-free, and super tasty!! I’d like to see Elizabeth Shaw’s chocolates range in the hamper because she caters for every occasion and uses a variety of chocolate to accomplish this. Cadbury – the best chocolate in the world! I keep meaning to try Booja booja, so it would be nice to see those in the hamper. I absolutely adore Lindt because its so smooth and creamy. So that would be my choice! I like dark chocolates of any makes, as long as they are not bitter! I adore all chocolate but I would like to see Willie’s cacao in mine, it’s so delicious! Some Butlers hot chocolate sticks, taste wonderfully divine. I would chose a milk chocolate box like Lindt Lindor as they could be shared with the teenagers in the house and leave the chocolates in this hamper all for me. Maybe this doesn’t even qualify but we are a family obsessed with toffefee! Also I love Lindt creation pistachio! I’d love to see Kacao from Richmond featured – small batch producer and they work with my favourite tea company, Birdhouse, to produce tea-infused chocolate! Sounds delicious Laura. I’ve not heard of either Kacao or Birdhouse, but then I haven’t visited Richmond in more years than I care to remember. Monty Bojangles because their truffles taste like pure heaven! I love all chocolate!!! Lindt and Green & Blacks are delicious but I’ve yet to find a chocolate I dont like, please let me win this!! Some chocs from our local chocolatier – Melchior in Devon! There is a lovely chocolate stall on Greenwich Market (can’t think of their name, total brain fuzz). Their chocolates are beautiful. Booja Booja chocolate truffles – not because they are dairy free (I’m veggie not vegan) but because they taste heavenly. I was given a free sample and you really wouldn’t believe they are dairy free. I agree. I haven’t had any in years, but they still live on in my mind as being some of the best truffles ever. I love hotel chocolat, anything they sell I will eat with pure joy! Shame it’s quite expensive. Green & Blacks Cherry, it’s my husband’s birthday soon and it’s his favourite. Thorntons are my favourite.. I ADORE their milk chocolate!! Not fussed by the brand, but I would love some white chocolate – Love the creamy taste. Guylian Praline chocolates – they’re so delicious & moreish and I could eat them all day! given the truffles as a gift from a friend and they are amazing..really special chocs! You’re the second person to mention Highland Chocolatier – I think I need to check him out. I love Green and Blacks dark chocolate. A little goes a long way! For me it would have to be Lindor, the chocolate is so creamy. Lindt chocolate or aero!! I must admit I love chocolate, but in small amounts! I would like to see some very dark 80% solids chocolate which is wonderful for cooking and also good to eat! I love nearly all types of chocolate but a box of Lindor from Lindt would be a real treat. I would like to see Hotel Chocolat in the hamper because everything they make is amazing! I have recently discovered Rococo, they make the most delicious bars and boxes of chocolates. Would be a great edition to the hamper. I’ve only ever tasted a couple of their bars, which were fab. Would love to try more. I’d love to see Lindt. I think it’s the creamiest and tastiest chocolate. Just checking, is this the comment you want deleted Lisa? Aero family Bars as i just like mint chocolate. I’d love to see Lindt chocolate as it tastes amazing. Montezuma’s is a great chocolate brand. I can’t resist popping into their shops if I pass one. I love most chocolate, my all time fave has to be orange chocolate anything this flavor goes down a treat! A D/F option, Booja Booja is a fave of mine! Ooh??? Not heard of them Leanne. I’m really enjoying finding out about all sorts of artisan chocolate companies I didn’t know about. I love chilli chocolate – Green and Blacks make some and it is delish! Galaxy because it has always been my favourite brand of chocolate. Just really creamy and tasty. Thanks Victoria. I didn’t know Montezuma’s did a 100% bar – fabulous. I haven’t had any of their chocolate for years, I really should try it again. Lindor. I love they way its always cold on the inside. I’d love to see a Terry’s chocolate orange in here as it’s my favourite. I love Green & Blacks and Lindor. Cocoa Loco – based in Horsham a family business who create gorgeous chocolate loveliness. I’d like to see some Hotel Chocolat in there, it’s a fantastic product range. Ooh yes I’ve tried that one. It is lovely, but perhaps a it too expensive to bake with? Godiva truffles they are so luxurious and just make you feel special. Prestat as I was lucky enough to try their assorted box earlier this year and they had some amazing fillings. I love the Monty Bojangles truffles. Also love Hotel Chocolat and Green and Blacks! I’d put some Kernow Chocolate in there – they do some very yummy chocolate bars! Lindtt I love the chocolate bars especially the flavoured ones. Green and Blacks as it is mine and my family’s favourite chocolate. Making me hungry for some chocolate already! Chocolarder from Cornwall; the most divide UK-made chocolate bars around! Hooray, well done you. They are one of my favourites too, but hardly anyone has heard of them. Selfridges have a range of chocolates which you buy individually and put in various sized boxes. I have not, to date, found one I dislike. Green & Blacks – they have such a great range of different flavours. Mini ones are good because you can have a real variety without spending a fortune. Love trying new brands though,,,,so any artisan brand would be good, too. Lindt because its absoloutly delicious and I can’t get enough of it! I would say Galaxy chocolate as it is my favourite,it is so creamy and luxurious which is perfect for a chocolate hamper! I’m really quite astonished at how many chocolate companies I’ve never heard of before … and here’s another one! Terry’s dark chocolate orange, dark is more staisfying than milk. Ooh another chocolatier I’ve not heard of Cat – thank you. Lindt – I love the excellence range, the sea salt or the orange ones are the best! I would like to see Galaxy chocolate, as I know how good it tastes and it would make my mouth water to see it in the hamper! Green and Blacks because their cherry chocolate is gorgeous! I would love to see Terry’s Chocolate Orange in there because it’s not Terry’s, it’s mine! I can’t get enough of it! Love the taste of orange milk chocolate! is it wrong to say Cadbury’s? The hampers look great – and i’m sure Sarah and I could work our way through it easily. The kids don’t want too fancy chocolate – and my brother is very fussy (cheap and cheerful for him) so a few lighter bars would help appeal to everyone. Kernow Chocolate from St Eval in Cornwall, hand made chocolate bars in delectable, imaginative, flavours – they’re fab! My favourite is Lemon Meringue but they make all sorts of bars in white, milk and plain. They’re perfect for British Hamper Co as they’re an independent company and very high quality. Oh, and DELICIOUS! Lindt. I love their melt in the mouth chocolate. It comes in so many flavours too. Lauden Fine Chocolate from Leeds is a fantastic chocolatier and would be a nice addition! I would like to see Lindt chocolate. They have such a good range with some unique flavours. Especially the addition of sea salt and Wasabi. I would like to see Lindt. It is one of my favourites. This looks amazing though. I love chocolate. Milka because it’s my silky smooth choccy treat! I do like Green and Blacks, but any chocolate with sea salt makes me happy. Kinder because they are absolutely delicious and I love giving my children the surprise from the kinder eggs. Simon Dunn of Stockport, stunning chocolate. Divine – they are ethically sourced and organic and tasty, everything that makes good chocolate! Beech’s (Lancashire), so not local to me but their vegan dark chocolate lime and chilli thins are absolutely wonderful! Failing that, last Christmas a customer brought us in the most divine chocolates that were handmade somewhere in Devon but no idea where! Any I love all Chocolate! I love kinder eggs! Yum! For me it would have to be Lindt milk chocolate. It tastes so yummy! Hotel Chocolat would probably be top of my list. I used to subscribe to their chocolate tasting club and some of their chocolates are amazing!! Ferrero rocher or Toblerone. Anything nutty as it feels a bit more nutritious. I eat a lot of chocolate so it needs to cover a number of food groups! Lindt white chocolate, especially the balls are delicious. Melt in your mouth and I could just eat a dozen in one go and not feel yucky like usually from white chocolate! This might be heresy, but I do have a soft spot for a bar of Hersheys Cookies and Cream. I love galaxy. So rich and creamy and devine. Yum! I would love to see Divine Chocolate in the hamper. It is my favourite brand and is also Fairtrade, which makes it doubly nice. I love all kind of chocolates all the formats and tastes. But I recently became a big fan of maltesers. Though I love dark chocolates darker the better.mum yummy.